The Pinoy Show cast performs a traditional Filipino dance. The show was organized by Kaibigan, the Philippine Student Association. 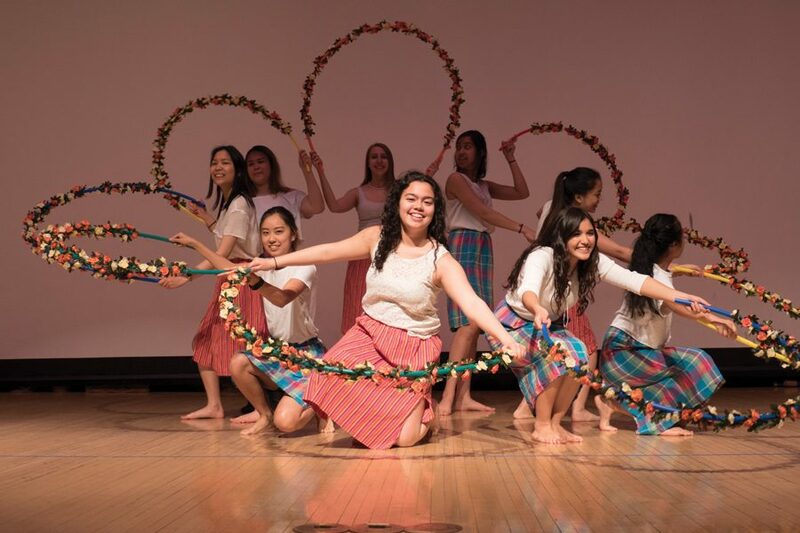 The 2018 Pinoy Show featured traditional dances, Filipino history and several “Game of Thrones” references Saturday in Ryan Auditorium. This year’s show, “A Song of Kai and Fire,” centered on the storyline of 18th-century Filipino revolutionaries Diego and Gabriela Silang. Communication sophomore Andrea Albanez, who played Gabriela, said her character continued to fight for independence after her husband died. Albanez said this particular Pinoy Show allowed her to explore what it means to be a Filipino woman. In general, being a part of Kaibigan — the Philippine Student Association — has been an immersive opportunity to learn more about Filipino culture, she said, especially because she did not know many Filipino people outside of her family before coming to Northwestern. Weinberg senior Joanna Ko, who was a producer for this year’s show, was quick to point out that Kaibigan and Pinoy Show are not just for Filipino students. She said Kaibigan does not operate on “face value identifications” like other cultural groups on campus might, in part because the Filipino community on campus is not large enough to put on an annual production of Pinoy’s scale. Ko said approximately 40 people were involved in the 2018 Pinoy Show in some capacity. She and the other Kaibigan members seek out new Pinoy Show participants from their social circles throughout Winter and Spring Quarters, she said. While many friends initially get pulled into Pinoy Show to help out, she said they stay for the sense of community. Communication senior Dominique Teoh, another producer of the show, spoke to the experience of being non-Filipino in a Filipino student group. He said he was born and raised in Malaysia and has never been to the Philippines. Teoh said he was attracted to the community offered by Kaibigan and was also fueled by his personal interest in other cultures. After four years of being a part of the group and performing in Pinoy Show, he said he has found a personal connection to the culture and history of the Philippines. More than 200 people showed up to Pinoy Show this weekend, Ko said, including friends, family and “Kai-lumni.” She said the alumni turnout exemplifies the deep level of connection people feel to the Kaibigan community. “‘Kaibigan’ means friend, and in a cheesy way, you could say it really means family to us too,” Ko said. This story was updated to clarify that Kaibigan members spend significant time contacting friends to join the show.